It is about a teenage girl growing up in a city but her grandmother was no longer able to care for her in her medical condition. Therefore she went to live with her dad on a ranch and became in love with a beautiful mustang who everyone thought was impossible to break and yet Flicka (the mustang) was quickly united with the girl. It was fine, but kinda predictable. Her bonding with Flicka, the stable hand romance, her taking Flicka into the woods, the rodeo drama with Carrie going into the ring to calm Flicka. It was a good movie, but Katie wanted to be a rancher. I would recommend the movie, but I would probably rate it 3 stars and a half. Plus, Carrie was a sickening brat. All three Flickas were amazing. They're not boring or anything. Katy wanted to be a rancher not a vet. I met a horse like Flicka. She mended my broken heart too. Dad said she was too wild so every afternoon after school I went out to the place I found her and I train her. The last couple of days I finally was able to ride her, and dad was so mad he wanted to put the horse down. Dad almost got rid of her, but I decided to set her free so no one can get rid of her. Is there going to be a Flika 4 because i like Filka. i rrrrrrrriiiiiillllllllyyyyyyy want flicka 2. This movie is totally awesome!!!!! I think it is way better than Flicka 1. I also like Flicka 3 but Flicka 2 is way better!!!!!!!!!!!!!!!!!!!!!!!!!!!!! I loved Flicka 2!! The horse(s) they used to play Flicka were beautiful. My total dream horse. Anyway, I actually liked it better than the first one. I thought the acting in the first one was a little corny, but maybe that's because I saw the original "My Friend Flicka" and knew mostly the plot. Anyhow, while I don't think Katy would have left to be a vet and she wouldn't have let her dad sell the ranch, I was an AWESOME movie!!! I thought Carrie was amazing! Must see!!!!!!! This is awesome! :) I have seen it many times a year!!!! I LOVE FLICKA 2! IT'S SAD IN THE END I CRIED A LOT. I WISH I HAD A HORSE LIKE FLICKA. flika is so pritty yyyyyyyyoooooollllllllll!!!!!!!!!!!!!!!! flicka is so beautiful that all i got to say so besssssssssst!!!!!!!!!!!!!!!!!!!!!!!!! i like both of flicka because i like horses so much do you like horses? i do it's fun to watch horse movies like dreamer and black beauty. i have the book black beauty and it comes back so yaaaaaa!!!!!!!!!! i likeeee!!! horseeeeessssssss!!!!!!!!!!!! welll that's all so seeeeeeeeeeeeeeeeeeeeeeeeeeeee!!!!!!!!!!!!!!!!!! yolllllllllllllllllll1!!!!!!!!!!!!! guys and girls haaaaaaaaaaaaaaaaaaaaaaa!!!!!!!!!!!!!!!!!!!!!!!! I got it! It's amzing.... I LOve It!!! i have this Flicka 2. i love horses so i have to love the movie and it is so good. Flicka 2 is the best!!!! Flicka 2 is awesome. the best horse movie ever!!! Flicka 2 is the best horse movie ever!!! i haven't watched it but kids say it's goooodieee. it sounds awesome for me, i'm horse crazy !!!!!!!!!!!!!!!!!!!!!!!!!!!!!!!!!!!!!!!!!!!! This movie isn't good. it's just like the first one. what the first one looks waaaaayyyyyyyyyyy better. Katie wouldn't leave flicka for a while for anything. I havent seen the 2nd one but im about to get it! i LOVE the 1st one, it's great! It inspires me to work with horses. I watched this and it is ace! its the best!!! Flicka 2 is about a girl who lives with her grandmother in the city. She has to move to her father's ranch because her grandmother was unable to care for her anymore due to her medical condition. She doesn't get along very well with her father in the beginning, but later learns to love him because of a horse named Flicka. Flicka 2 is based on Flicka 1. Katy which was the lead character in flicka one went to vet school so she gave flicka to her uncle to take care of her for a while until she got back from vet school. Katy's cousin carrie is the main character in flicka 2. She is the girl who ends up falling in love with flicka also. So it is about carrie and flicka. I watched Flicka 2 before the first one! :) They are both amazing, but I really liked this one! Someone said Carrie (The main character in the movie) looked like a grown woman, instead of the teenager she's playing. Well NO OFFENSE but I really think you're wrong. She looks like a teenager. Also Katie had to leave, if she didn't there would be no Flicka 2! I love this movie! It's great! Wonderful. EVERYONE SHOULD WATCH IT! I love this movie it is so heart warming but I don't like it when the snob girl acts like she wants flicka but she really wants to spite the girl. But then flicka saves her and they have a good ending I love this movie and the people in authority of it are awesome. I always saw the trailer for flicka 2 but I always thought it was not a good movie... I might try to see it now if I'm wrong ... The only reason why I would see it is because the first flicka was fantastic (best horse movie you could ever see) so I'm not sure maybe I will see it. I might be proved wrong. great movie, i loved it! I absolutely LOVED it! I want a copy of it sooo badly! It was one of the best horse movies I've ever seen! 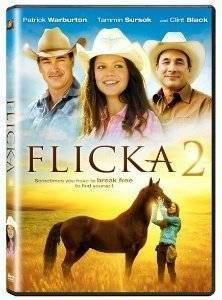 Note from Sydney: If you want to buy a copy of Flicka 2, ask your parents to help you order it from Amazon. If they agree, just click on the images in this submission. It was pretty good but I liked the first one better. i absolutely love the movie. i love horses so i have to love the movie. i love how carrie turns from a city girl to a country girl. i don't have a horse but i want one like flicka. I LOVE LOVE LOVE LOVE LOVE Flicka soooooooooooooooo much! She's so beautiful! I havent seen this movie yet but i think it will be a great movie because all my horse crazy friends have seen it and said it is AWESOME!!! peace out homie!!! this sounds awesome!! i watched flicka on the weekend and loved it.